1.3 million of Payday 2's 1.58 million copies sold were from digital distribution channels such as Steam. Payday 2's wildfire success was surprising to everyone, including the game's publisher: 505 games, which ran into some retail shortages of the game. Developer Starbreeze has now announced that the game has already sold almost 1.6 million copies, absolutely blazing past the 700,000 or so lifetime sales of the first Payday game. Furthermore, some 80%, or around 1.3 million, of these sales have been from digital downloads via services such as Steam, Xbox Live Games on Demand, and the PlayStation network. Obviously, the retail shortage plays a part in this, but that is still a very impressive number. Perhaps the future Microsoft envisioned, where physical disk-based games are a thing of the past, isn't too far off after all? It is worth noting that the first Payday, which received mixed reviews from critics, was available exclusively via download. 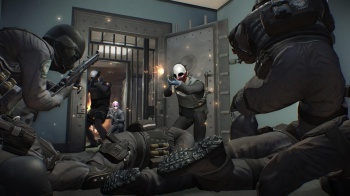 Payday 2 developer Starbreeze recently announced that a full year worth of DLC is being planned for the title.